The modern practice of cremation dates back to the middle of the 19th century. Yet, throughout history, many cultures have chosen cremation as a method of caring for the dead. Very simply, cremation is the process of reducing the body to bone fragments through the application of intense heat. In recent years, cremation has become increasingly popular in the United States . More people are choosing cremation today simply as a matter of personal preference. Cremation is often considered to be an inexpensive, less complicated substitute for the “traditional” funeral. Many people also believe that at the time of death only two basic choices exist: immediate cremation of the body or a complete funeral including viewing, followed by burial. Actually several options are available in between for those who prefer cremation perhaps even more than with burial. As times change, trends change too. Today many opportunities exist for meaningful services for the benefit of family and friends – both before and after the cremation process takes place. Just like burial, cremation can occur after a funeral service where the body and casket is present at the service. The only real difference between a funeral followed by burial and one followed by cremation is that the body is taken to the crematory after the service in lieu of procession to the cemetery. A memorial service, like a funeral, is a service of remembrance, only without the body present. It may be held at a place of worship, the funeral home or any other appropriate location. Regardless of the site, we will assist in planning and organizing the service, and provide the necessary staff to direct the service. An urn may be present for the memorial service, as the casket would be for a funeral. An immediate or direct cremation is limited to the prompt cremation of the body following death, with no formal funeral or memorial services. Following cremation, the cremated remains are returned to the family for disposition as they wish. While these descriptions cover the general type of cremation services, your choices are not required to fit exactly into any particular category. There are literally “options within options” available to provide a meaningful service. An urn serves the same purpose after cremation that a casket does with burial: it contains the remains and becomes part of the memorial site. Urns range in style from classic and traditional designs to contemporary. Their composition may range from hardwood, stone or marble to castings of bronze, copper or other precious metals. 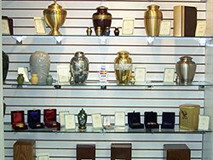 Urn prices will vary according to their size, materials and workmanship. Embalming is most often a matter of practical necessity for a service with the body present. For immediate cremation, embalming is not required. Memorialization is the act of establishing a permanent means to commemorate the life of the deceased. Several choices exist: Inurnment is the placing of an urn within a niche in a columbarium. Columbaria are most often located within a cemetery and may be an entire building, a room or a series of niches along inside walls. Some people prefer earth burial of the urn rather than placement in a columbarium. Urns may be buried in standard cemetery plots and this is a frequent choice when space for the deceased has been reserved in a family plot. In many instances, two urns may be placed in one adult size space. Some people prefer scattering. Today, it is not unusual to hear of someone's cremated remains being scattered in the air or over water. This is legal in many areas, and though it may have particular appeal for some people, survivors' feelings should be carefully considered. Pre-arrangement is a thoughtful method of funeral planning which grows in popularity every year. Some people do this with the sincere desire to avoid being a burden on their families. Others like the idea of “having taken care of everything,” and yet others may have no one else who can make arrangements for them. Pre-arrangement is a wise choice in regard to cremation. When death occurs, it is the next of kin who assumes primary responsibility for the disposition. Making funeral arrangements for someone while guessing at their preference may be one of the most difficult tasks a person can face. Having your choices and instructions on services and cremation on file with a funeral director eliminates unresolved questions, which may confound others. Funding the cremation service can further ease the financial concerns of family members. This allows you to arrange the kind of service you prefer and be assured of adequate funds for the future payment of the service.